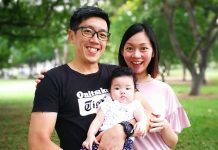 Merlion Park attracts throngs of visitors, all eager to take a picture with the iconic half-fish half-lion that is an internationally recognised symbol of Singapore. 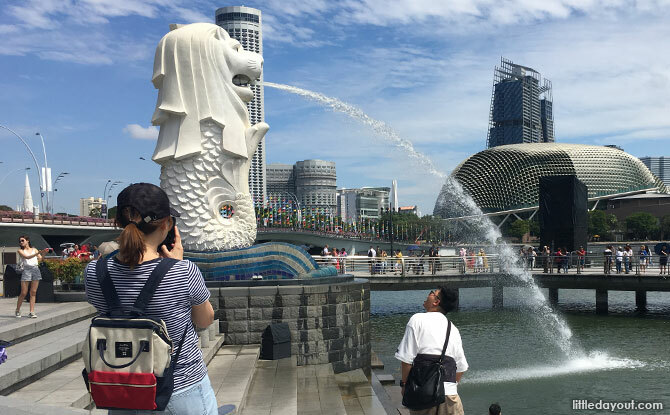 With a viewing platform that extends into the Marina Bay Reservoir, Merlion Park offers plenty of vantage points for an encounter with the mythical beast. 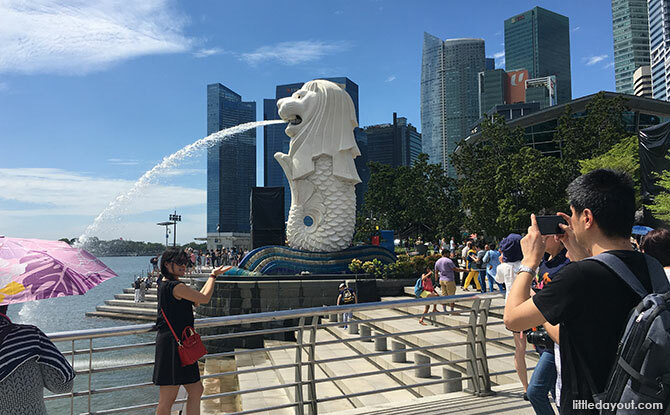 Located where the historic Singapore River meet the Marina Bay Reservoir, the Merlion statue with water spewing out of its mouth looks out towards Marina Bay Sands. 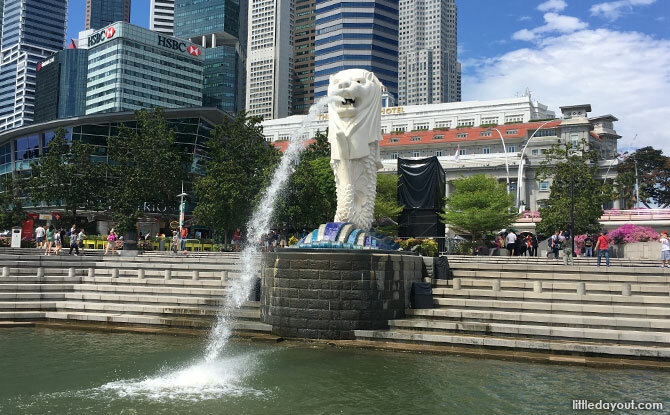 Standing 8.6 metres tall, it is the work of Singaporean sculptor Mr Lim Nang Seng. 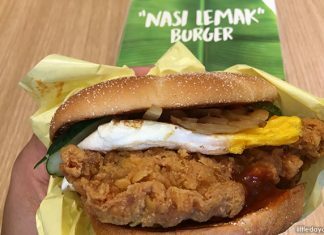 It was first unveiled on 15 September 1972 by then-Prime Minister Lee Kuan Yew at the original Merlion Park, a location now hidden behind the nearby Esplanade Bridge. 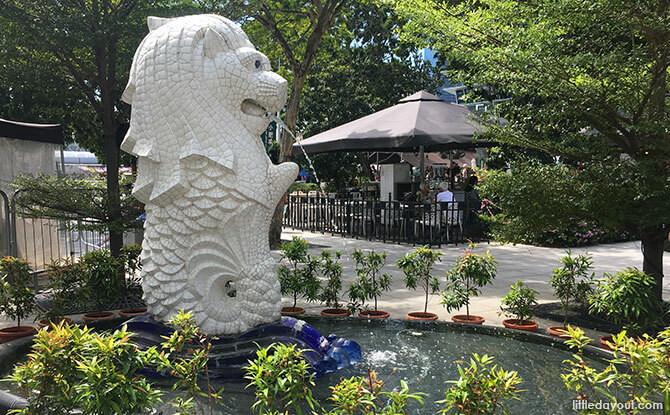 The current Merlion Park was built in the early 2000s and the Merlion Statue relocated to its present site in 2002. 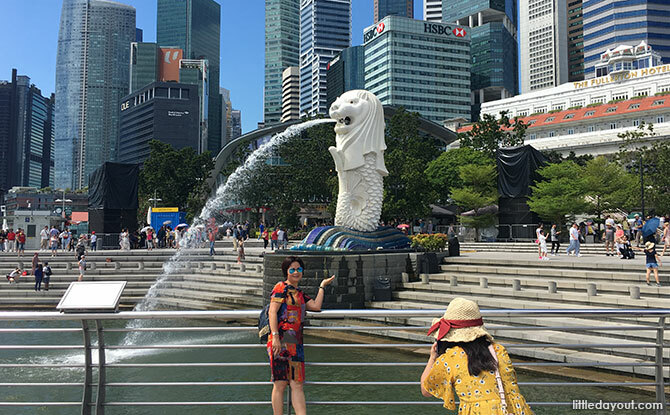 Popular poses at Merlion Park including positioning one’s self to “drink” from the Merlion. 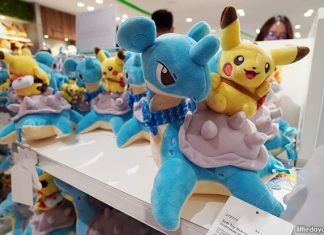 Or letting its water fall into one’s hands. 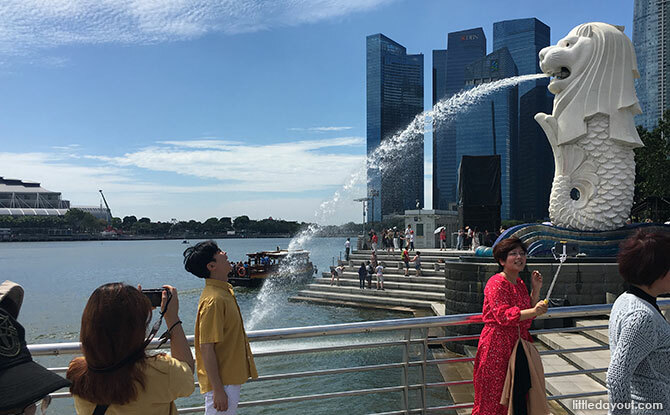 Of course, there is nothing wrong with just taking a conventional photograph in front of the Merlion either. 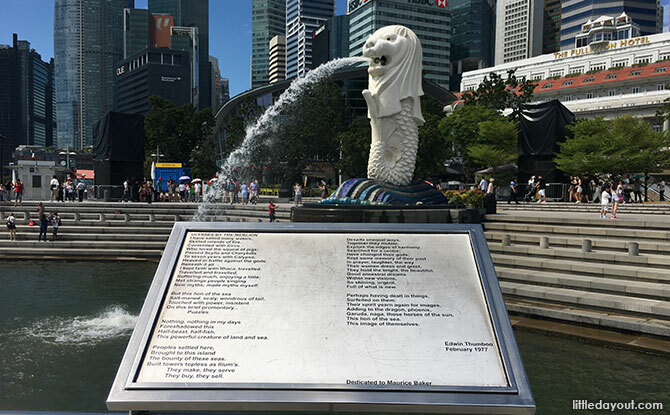 Also in front of the Merlion is also a plaque etched with Singaporean poet Edwin Thumboo’s poem Ulysses By The Merlion. 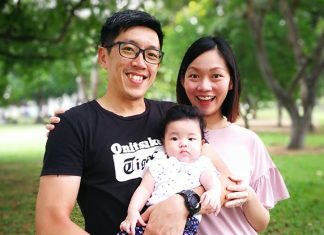 Behind the big Merlion is a “baby merlion”. 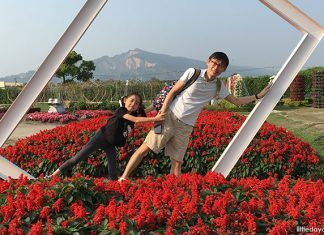 This smaller statue is generally less thronged with crowds. 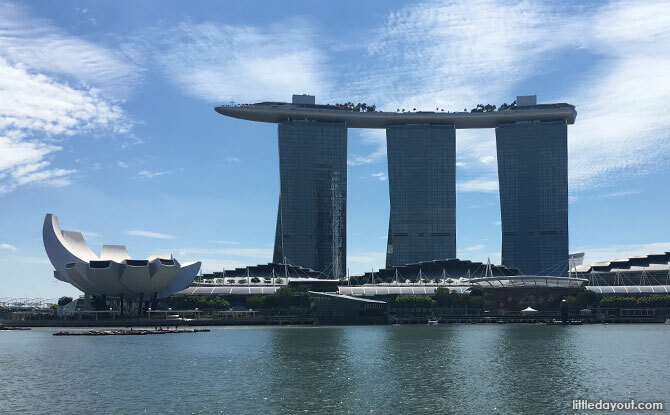 The viewing platform at Merlion Park is also an excellent place to soak in the view of the Marina Bay which includes Esplanade – Theatres on the Bay, Marina Bay Sands and the Singapore Flyer in the distance. 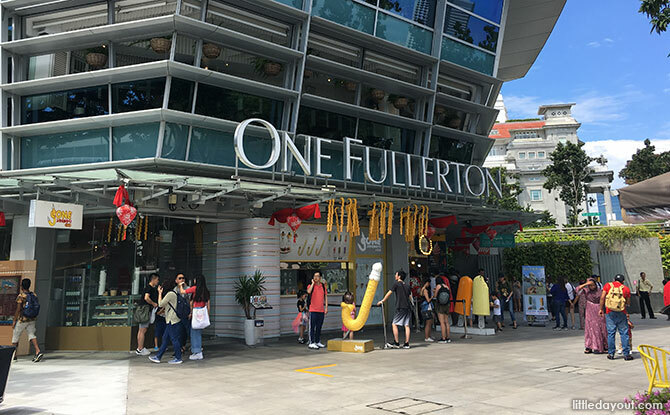 Around Merlion Park, there are shops selling light refreshments. 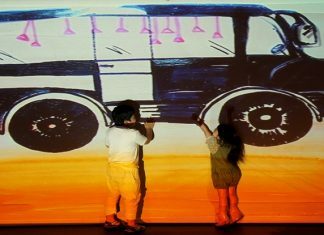 More kiosks can also be found under the Esplanade Bridge. 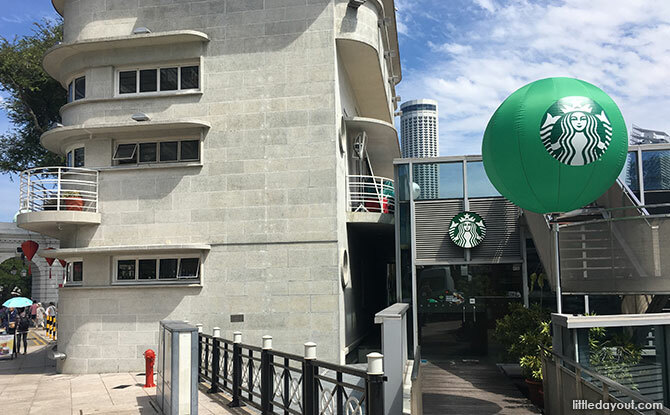 For those who wish to escape from the heat, there is a Starbucks located in the building next to the Esplanade Bridge. 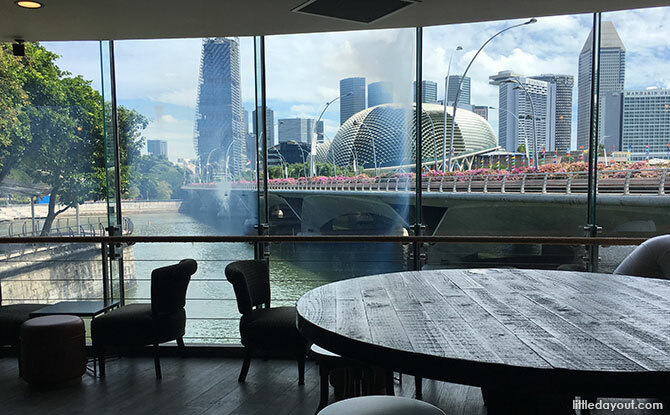 In addition to caffeinated offerings, this Starbucks also has a nice view from its seating area. 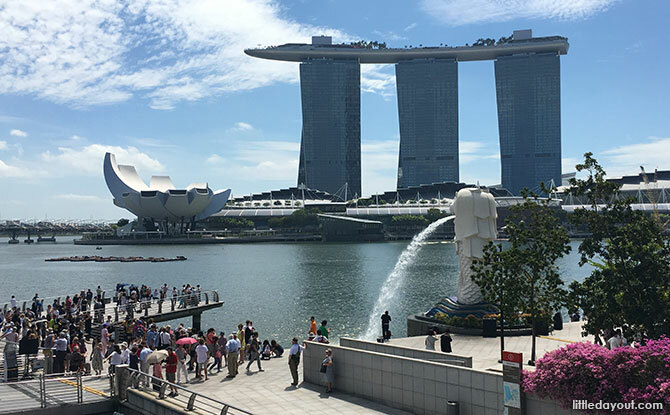 From Merlion Park, it is possible to proceed to explore the Civic District, Esplanade Park and the Marina Bay area. 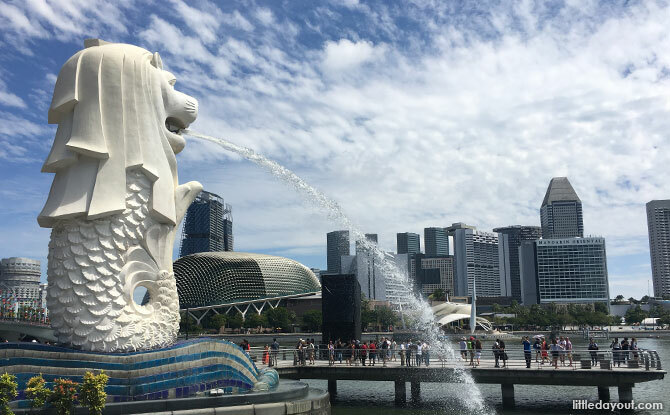 The Merlion Park is must-visit-at-least-once location in Singapore. 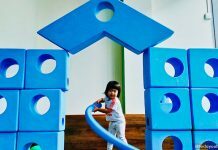 It poetically presents a historic link to the past while looking out to the future.